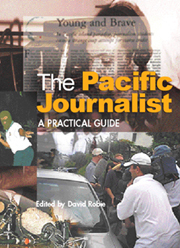 Lack of professionalism, pressure and intimidation from government or from rebel or terrorist movements threaten the independence of journalists in the South Pacific, warns author David Robie. Lack of professionalism, pressure and intimidation from government or from rebel or terrorist movements threaten the independence of journalists in the South Pacific, warns journalist and media educator David Robie. 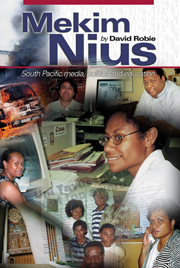 Pressures and dilemmas for the news media continue to gain momentum in the South Pacific, Auckland University of Technology senior journalism lecturer Dr Robie says in his latest book, Mekim Nius: South Pacific media, politics and education, published by the University of the South Pacific Book Centre, Fiji. Often these mounting pressures and dilemmas are from a cultural as well as a political dimension, Dr Robie says. Pressure can also come from powerful media owners. He cites a 1999 Commonwealth study on media freedom, Speaking Freely, in a section on the Pacific that said journalists' writings "may be dictated by their employers, as is now increasingly common". * Three coups in Fiji and a continuing threat of terrorism there. * Corruption and the legacy of the Bougainville conflict and the Sandline mercenary affair in Papua New Guinea. * Armed conflict and terrorism in New Caledonia, the Solomon Islands and Vanuatu. A major issue facing Pacific journalists, according to Dr Robie, is how to improve professionalism and standing in society. Dr Robie calls for a major change to alter the mindset among some news media organisations that are reluctant to invest in human resource development and to recognise the importance of education. "Media managements, particularly in Fiji where they could emulate Papua New Guinea, need to shed their haphazard attitude and adopt a real commitment to professional journalism education provided by the Pacific universities," Dr Robie says. He calls for journalists with a quality allround tertiary education and development of problem-solving and critical, analytical skills. The universities, Dr Robie says, face an increasing challenge in identifying and addressing the media's real needs and equipping a new generation of journalists with the philosophy, socio-political, historical and contextual knowledge to match the technical skills of being effective communicators and political mediators in their developing societies. Across the board in Fiji and Papua New Guinea, and even more so elsewhere in the Pacific, says Dr Robie, journalists' salary structures are "pretty appalling", as one prominent PNG journalist described it. She echoed the views of more than two-thirds of the 57 journalists and media executives of policy makers interviewed for the book. This state of affairs raises concerns, Dr Robie says, about how exposed the media may be to the influence of so-called "envelope journalism" - inducements or bribes by unscrupulous politicians, as in Indonesia, the Philippines, Papua New Guinea or the Solomon Islands. South Pacific news media, says Dr Robie, have faced mounting criticism over professional and ethical standards. Criticism focuses on lack of professional training for journalists, poor education standards, lack of knowledge of the political and social institutions, cultural insensitivities, and a questionable grasp of ethical issues. Some argue that the media are too Western and not the "Pacific way". Others, particularly politicians, are keen to introduce regulatory controls. However, the media defends its integrity. While acknowledging some shortcomings, including lack of training, the media insists self-regulation is best. Cultural challenges and dilemmas include Fijian reporters being hesitant to interview high-ranking chiefs of their province. The chiefly system needs to be respected. Society is reluctant to accept media questioning of the chief. In Papua New Guinea, more vigorous questioning of leaders (who are not hereditary) is acceptable. However, "wantok" and "big man" systems and tribalism could still influence a PNG reporter. In his conclusion, Dr Robie says: "It is vital that journalists have a good analysis of the role of the media and its relationship with good governance, freedom of speech, human rights and executive power. 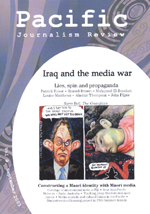 Only a genuine understanding of what is at stake can give journalists the will and the wisdom not to bow to the considerable pressures on South Pacific media freedom by governments, business and corporate power, and by non-government organisations." Non-partisan forums such as the universities, says Dr Robie, rather than sponsored courses that are open to claims of hidden agendas, offer young journalists the confidence to pursue their stories in the face of social, cultural, political and religious pressures.